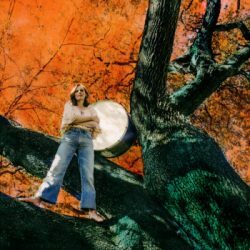 In 2015, after almost two years on the road touring in support of her album Travelling Alone, Tift Merritt decided to take a year off the road, just “to see what would happen to me.” What happened, as Tift enjoyed the solitude of a friend’s ranch in Texas, was the inspiration to write. This was the starting process for Tift’s latest offering Stitch of The World. Her experiences during that period were to lead to songs inspired by her surroundings of the time. Wait For Me, about leaving the disappointments of the past behind and believing that good things are up ahead, was provoked by the long straight roads that she found in Texas. Watching the ranch hands toiling with their daily routine helped provide the theme of working through times of struggle and the persistence of love in the beautiful and hopeful song, Love Soldiers On. As the location changed, from Texas to California to New York, the inspiration for new material continued and the result is yet another terrific collection of songs from Tift. Eastern Light is a haunting song, imagined in a moment of heavy sadness washing over her as Tift looked out at the East River. Tift is joined on this and two other tracks by Sam Beam (Iron & Wine) who also does a stellar job of co-producing with Tift. This is Tift’s sixth studio album and there is a maturity and confidence about this album that suggests an artist totally at the peak of her talents. The songs are all beautifully sung and there are times that her voice morphs into Emmylou territory with a slight quiver here and there, especially on the slower tunes that make up the bulk of this collection. Dusty Old Man, an up-beat, fun celebration of maturity over youth bucks this trend with its driving rhythm and, if it offers a slightly false impression of what is to come, it is, by itself, a terrific opener. All the songs are written by Tift except My Boat which is adapted from the poem of the same name by Raymond Carver. As well as the aforementioned Sam Beam there is excellent musical support here from Marc Ribot (guitars, ukelele, banjo), Jay Bellerose (drums), Jennifer Condos (bass) and Eric Heywood (pedal steel). There are so many highlights on this CD that picking out just one is a fruitless occupation but as an example of the quality of song writing and vocal performance on display here listen to Icarus. And, once you have done that, go and buy what is already one of the albums of the year.